Today's Illustration Friday word is one of my favorite ever! Probably because I'm a sucker for dessert. I can be tempted by anything ooey, gooey, fruity, chewy, flaky, or chocolately. But my absolute favorite dessert is a slab of good old-fashioned cake. 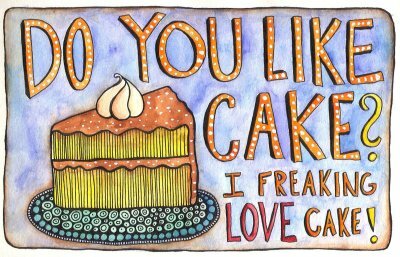 I freaking LOVE cake!!!! Nice work... and what a way to start the new sketchbook! Yum, me, too! And that looks like one of my very faves...yellow cake with chocolate frosting! Even the lettering looks delicious.